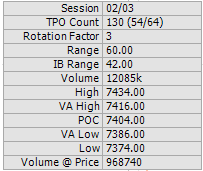 Nifty futures opened gap down (Sentimental gap down) on 3rd FEB followed by a balancing action. Back to Back poor high and poor low is noticed on yesterdays auction and prominent POC at 7404. And the value got formed completely on the lower side. And the Auction came in the direction of 3rd FEB Spike suggests possibilities of continuing on the lower side towards the nearest power low zones 7250-7270 zones if market sustains below 7404 in the very shorter run. 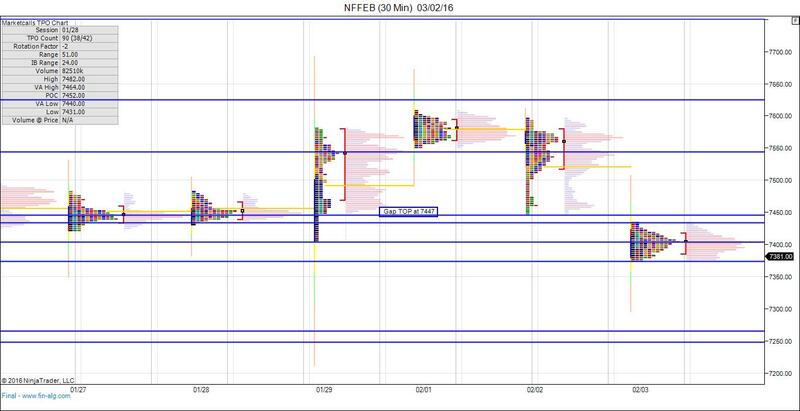 Yesterdays balancing auction provides very limited opportunity from the day traders perspective as markets are testing the IB Breakout zones thrice and the sentimental gap got a partial fill and left unfaded in yesterdays auction. And to be noticed markets came down with thin volume.